With the economic crisis engulfing Europe, the United States of America today reaffirmed its commitment to stand with the people of Spain and Europe during this financial crisis. In her remarks at the U.S.-Spain Council today, US Secretary of State Hillary Rodham Clinton said that the relationship between Spain and the United States is a vital on. 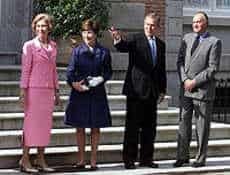 King Juan Carlos I and Queen Sofia with President George W. Bush and Laura Bush. She stresses that with great conviction that the central focus of the U.S.-Spain Council on expanding their economic relationship is critical to both countries. She notes that the United States is following events in Europe very closely, first and foremost because you are our allies and our partners. She says that happens in Europe has major consequences for what happens also in the United States. She cites that after all, Europe is US largest trade and investment partner. The United States fully recognizes that the decisions have to be made in Europe, but it has tried to be not only concerned friends, but active partners in helping all of us navigate through these challenging times. The United States supports the Spanish Government’s approach to restoring confidence in its economy through the recapitalization of the banking sector, fiscal consolidation, and labor market reforms, Ms. Clinton said. She says this crisis forces Europe’s leaders to make difficult choices, and to balance short-term and long-term priorities, which are not always perfectly aligned. She underlines that the US government will do all it can to evidence its strong support for these difficult decisions. She notes that since 2000, Spain has been one of the fastest-growing sources of foreign direct investment in the United States. In 2010, that investment stood at nearly 45 billion, making Spain our 11th largest investor, she reported. She notes now much of that investment has been in the green energy sector. Spanish companies are involved in a number of significant green energy and infrastructure projects in the United States, including a power company in Maine and a rail project in New York, she added. She notes that these projects will provide valuable services to Americans and they also create jobs for Americans. She cites that the United States is glad that so many Spanish companies have already invested in the United States, and it wants more companies to do the same. She notes that in 2010, U.S. foreign direct investment in Spain reached nearly $60 billion. Meanwhile, trade between two countries is strong, she cited. She cites that the United States imported $11 billion in goods from Spain last year. The US exported nearly the exact same amount, 10.8 billion, which is up nearly 25 percent since President Obama launched the National Export Initiative in 2010. At the Forum, Ms. Clinton urges the large Hispanic population, to take advantage of what they think could be a win-win for both countries. She stresses that US economic statecraft agenda includes working with the Spanish government. The US is elevating commercial diplomacy, directing its embassies worldwide to focus more on developing trade and investment. She stresses that there is much more that the EU and the U.S. can do together to unlock economic activity. The U.S.-EU High-Level Working Group on Jobs and Growth just issued its interim report a few days ago, she added. In the meantime, the United States is continuing to work through the Transatlantic Economic Council to expand economic opportunities between the U.S. and the EU. She stresses that United States doing its part by advocating for smart policies, finding and forging more business partnerships, working together more closely on relevant issues like harmonizing regulations and protecting intellectual property, and telling everyone that will listen that Spain and the United States are working together and open for business. The United States ally and Spain is the United State’s friend. Both countries collaborate closely on every aspect of their foreign policy, from countering terrorism to supporting new democracies, to driving economic growth through bilateral trade and investment. Spain and the United States are working side by side, such as in Afghanistan, where Spanish troops have made great sacrifice, most recently with the loss of life and injury. And we are just incredibly grateful. US has a strong bilateral relationship with Spain in working together to help Afghans rebuild their nation. The enduring partnership between the United States and Spain is rooted in friendship and common values. As NATO allies, both countries have worked closely and comprehensively to support the people of Afghanistan as they rebuild their country. Spanish troops are fighting the insurgency in Badghis Province and helping Afghan forces take lead responsibility for their own security. As global partners, both countries are working side by side to solve some of the most pressing problems. Both countries are committed to fighting chronic hunger. Spain was one of the founding contributors to the World Bank’s Global Agriculture and Food Security Program, which has already helped farmers boost productivity, encouraged investments in high-yield technologies, and helped improve nutrition for women and children. Both countries are working together to help the people and governments of Central America ensure safety and build prosperity. After the United States, Spain is the second largest donor of development assistance in the region, including its work with the Group of Friends, a consortium of governments and organizations that fosters aid donations. It is actively working in Guatemala, El Salvador, Mexico, Colombia, so many other places.